This Cajun Shrimp Guacamole Dip recipe opens up new options for enjoying this healthy appetizer. It’s low-carb and so good that you’ll want to keep the bowl to yourself and call it dinner! 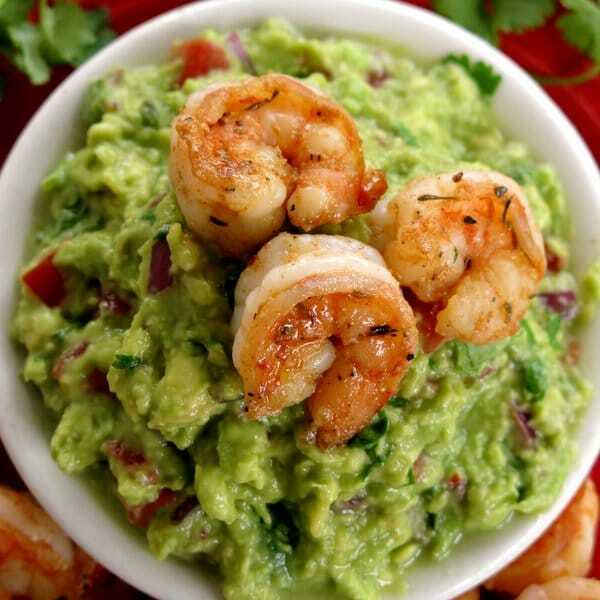 It combines spicy shrimp that takes less than 10 minutes to make with the best homemade guacamole around! There are plenty of ways to enjoy it too! No matter the final decision, it is healthy, low-cal, low-carb and very, very satisfying dish! 10 minutes! I swear that’s all it takes to make perfectly cooked spicy Cajun shrimp. Simply toss peeled and deveined shrimp with olive oil and a Cajun spice mix. Pour the shrimp into a single layer in a skillet. Cook for about 3 minutes and then flip the shrimp to the other side and cook for about 3-4 minutes more. It’s done when the shrimp turns pink on the outside and the inside turns white. I used this method for Spicy Shrimp and Cauliflower Grits and I rarely make it any other way now! I documented this simple tutorial for fresh guacamole dip over 3 years ago. 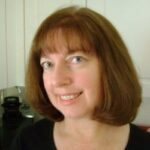 It’s one of my very first and most popular posts! Since I make guacamole at least once 2-3 times a month, I’m always looking for new ways to enjoy it. Of course, it’s a must on all things Tex-Mex. Guacamole Stuffed Mushrooms are also very tasty! But, if you’re looking for a low-carb way to enjoy this healthy dip, then give Cajun Shrimp Guacamole Dip a try. There will be no judgment here if you just want to call it dinner! Cajun Shrimp Guacamole Dip is low-carb and so good that you'll want to keep the bowl to yourself and call it dinner! Add shrimp, olive oil and Cajun spice to a bowl and stir to combine. Pour shrimp into skillet (along with any excess olive oil that is in the bowl) and cook over medium-high heat in a single layer for 3 minutes. Flip shrimp to other side and cook for about 3-4 minutes more or until shrimp is pink and cooked through. 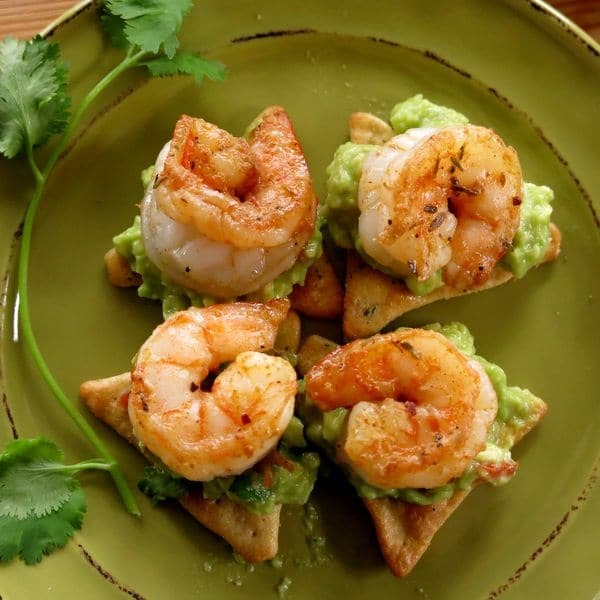 Serve shrimp as a dipper for guacamole or layer shrimp atop guacamole on your favorite cracker. I really love this low-carb version and I bet that cajun-spice mix really kicks up the flavor. I could probably eat the entire thing myself! 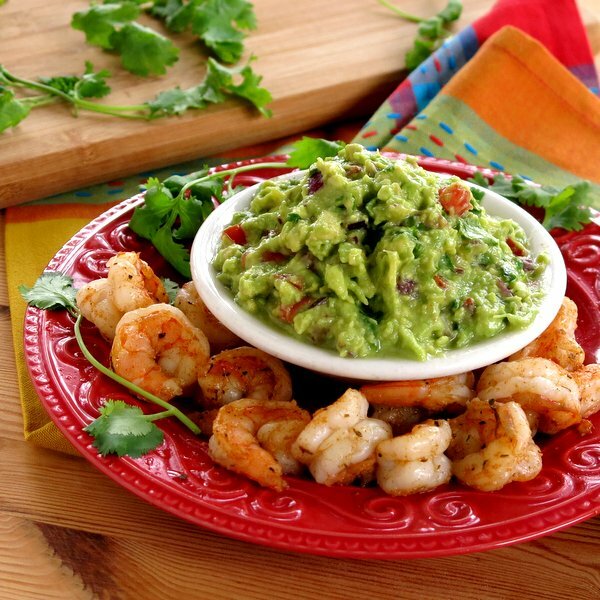 Guacamole is a constant snack here…I love the idea of making it with cajun shrimp! This would make for a very popular appetizer in my family. They would be the first to go. Anytime someone gives me dip and I can say it’s dinner I am all in! Especially with the shrimp! I wish I could reach through my screen and grab the plate! This looks fantastic! I would totally call that dinner! This is great for low-carbers. 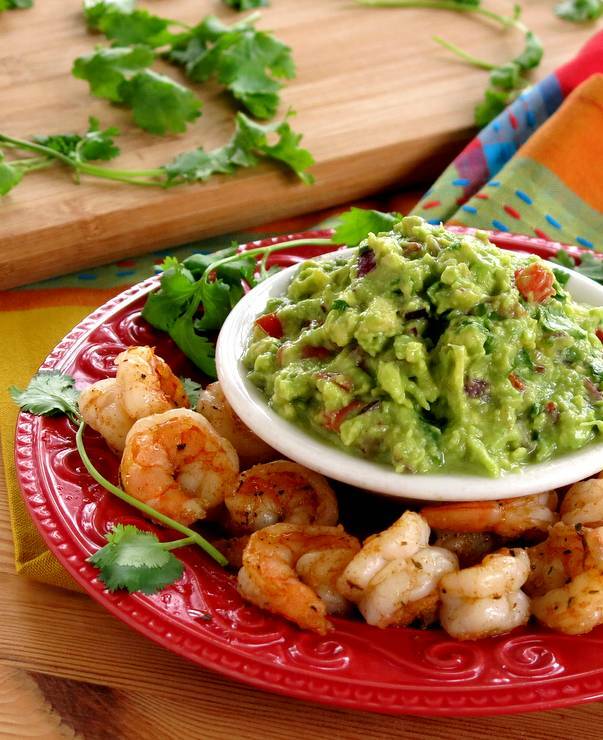 This is a fantastic guacamole recipe and an easy way to fix the shrimp. I had to add a little extra oil when cooking the shrimp.